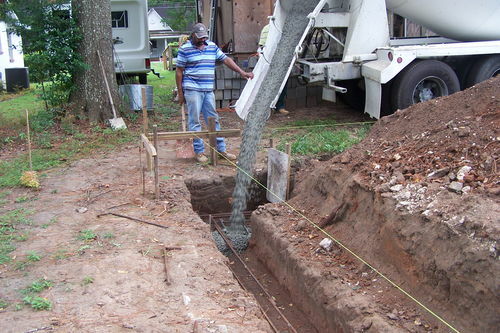 We got the inspection for the footer and poured the footer. 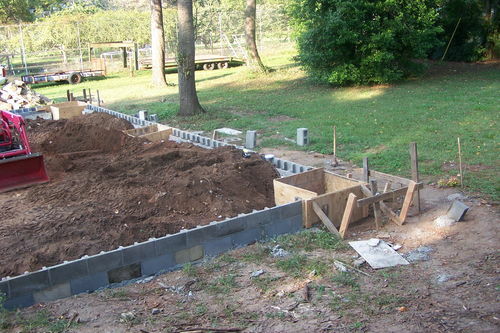 The block layer then laid the footer blocks. 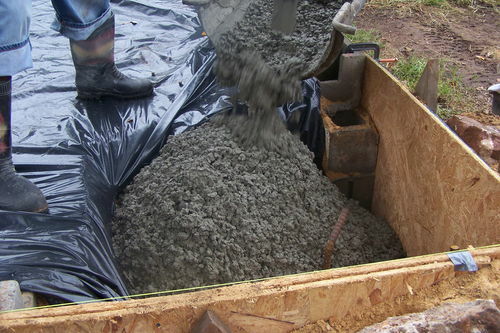 As you can see I have 6 3cuft pads in the footer. 1 on each corner and 1 in middle of each long wall. Still mad about this. 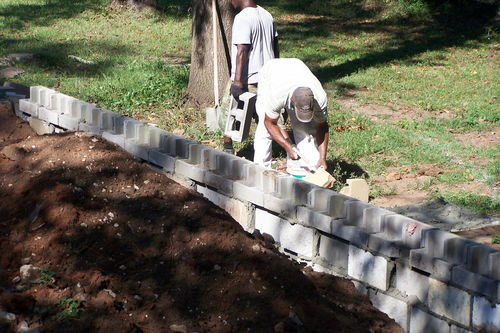 It took about 3 days to finish the footer and block werk. I had 2 step downs in the footer. 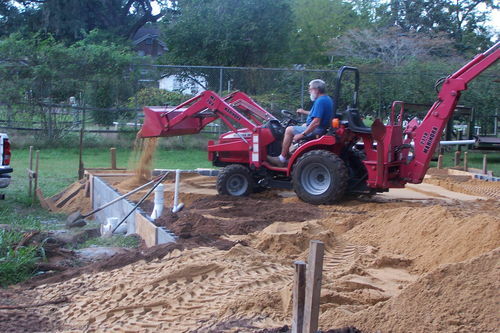 Due to the proximity to the property line they had to do a lot of pulling of the concrete down the footer channel. 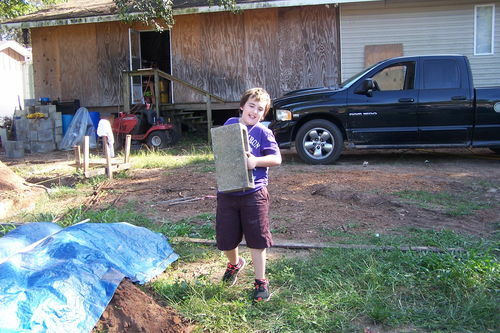 One of my Grandsons had to get in the picture carrying a block. 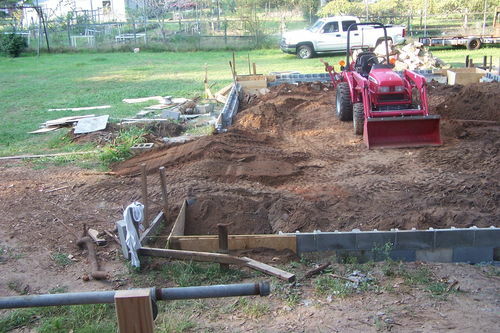 When we finished the footer and block werk I started on the ground werk for the floor. 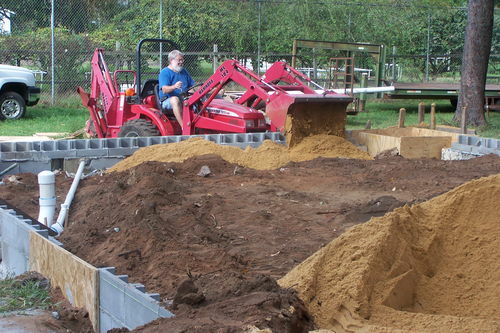 After leveling the floor I ended up having to buy one truckload of dirt to finish leveling. 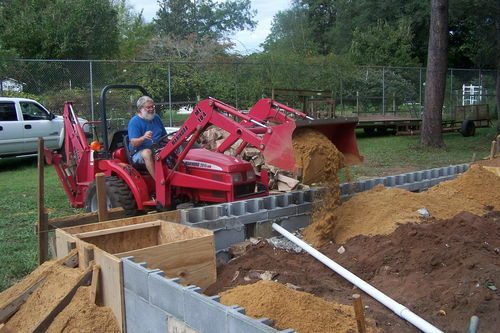 I then dug the channel for the DC pipe I installed in the floor for my table saw. I covered the pipe and installed my plumbing. I am putting in a commode and sink for the necessities. 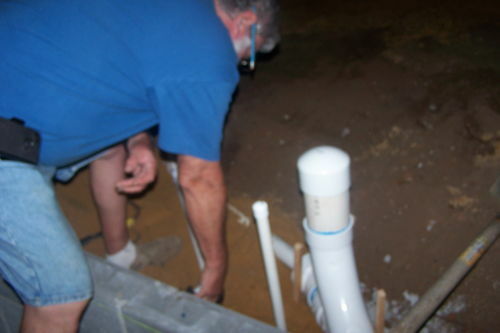 A couple of pic show the plumbing. 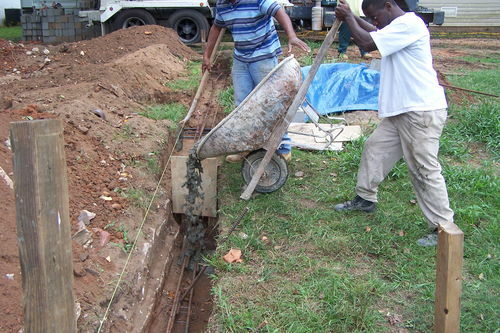 I then installed the conduit for the floor receptacles. I built a cover box to keep the concrete off of the junction box for the electrical circuits in the floor. I will have 110 & 220 receptacles in each leg. More on that in the electrical post. 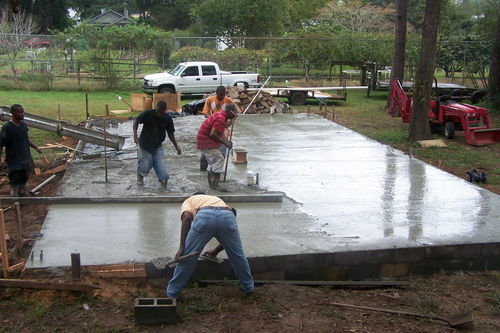 The concrete man came and did the finish leveling of the whole floor. 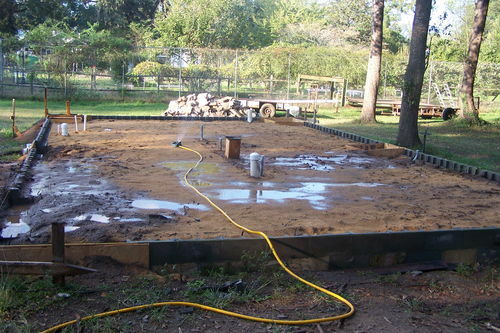 I put a sprinkler on the floor surface and ran for about 6hrs to help settle the dirt. This is where a good rain would have helped instead of me having to buy the water. 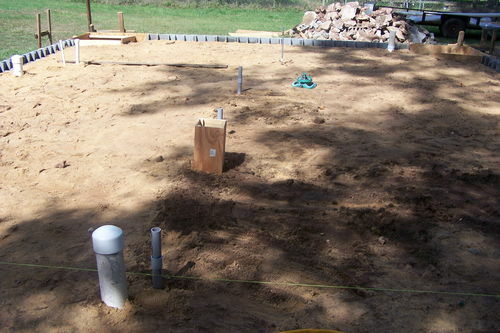 Last pic in this set is the finished foundation with the water running on it. 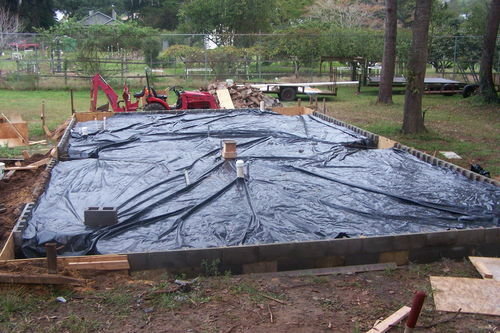 Well I finally finished the foundation werk and got my permit yesterday and we installed the plastic moisture barrier on the foundation floor. 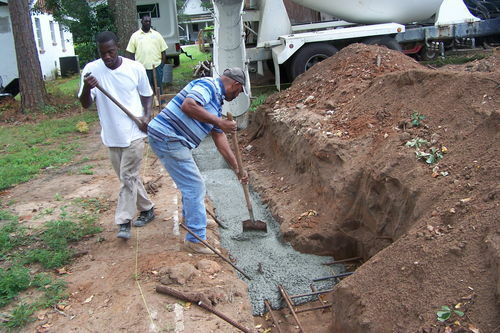 We immediately started pouring concrete. It was a cool cloudy day all day and about the time we finished the pour it started a light misty rain on and off the rest of the day. When it rained it was just enough to lightly wet you. 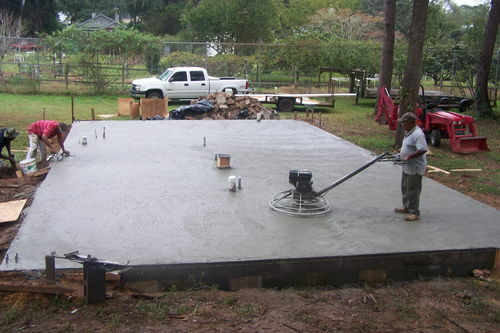 A limb sticks out over the floor and water would drip occasionally on the wet cement and make little plop intentions which were easily smoothed out by the finishing machine. 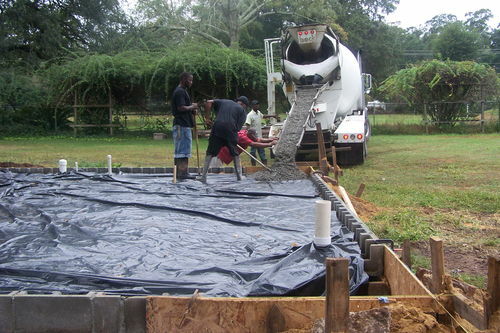 Funny thing is we had sunny weather this whole week we were preparing the ground for the floor then the day we pour concrete it threatens rain. We had several hard rains go around us on both sides but luckily none came through town and messed us up. 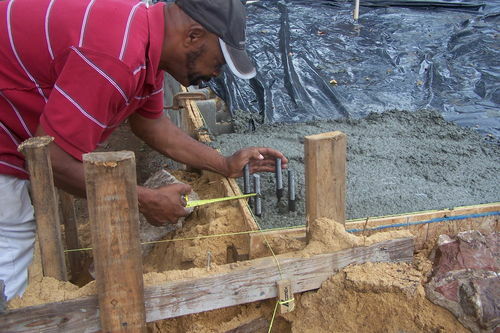 The building contractor fabricated a set of “J” bolts which we inserted in each of the pads to bolt the building down. 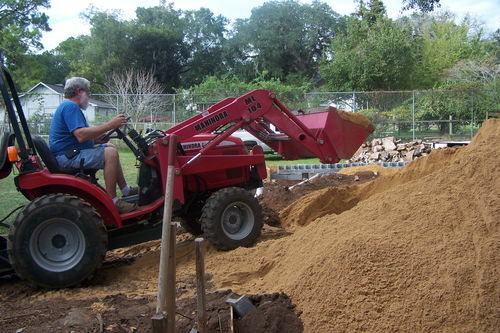 The building contractor will start putting up the building Monday barring any extenuation circumstances. He says it will take him no more than 3 days to put it up so possible Tues but almost definitely it will be up by Wed.
My wife and I plan to go to the mountains Sat bright and early so that will give me 2 to 3 days to get ready for the trip. I wont be doing anything else to the building till I get back from vacation on Nov 3. As usual I got to many pic but oh well enjoy along with me. 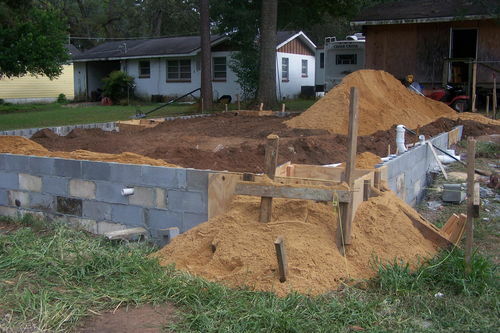 Dewayne, You building is coming along very nicely. Looks like you have plenty of help! That youngster looks mighty strong carrying that heavy block! 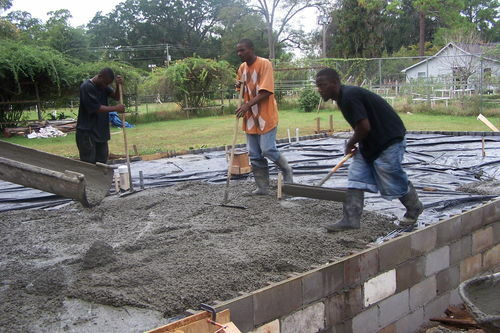 Isn’t is funny how the rain loves concrete! Your story brings back memories of me in a panic over a pour! Glad it all turned out well for you! Love all the photos too! LOOKIN GOOD DEWAYNE! HAVE A GOOD AND SAFE TRIP TO THE MOUNTAINS!! Really happy for you Dewayne. Looks like things have gotten better for you. The anticipation must be greater than I can imagine. If all else fails, you will have a great place to park the camper on. ha ha Good luck and keep us posted. Enjoy your time in the mountains. Great pics, wish they were mine. Looking good. 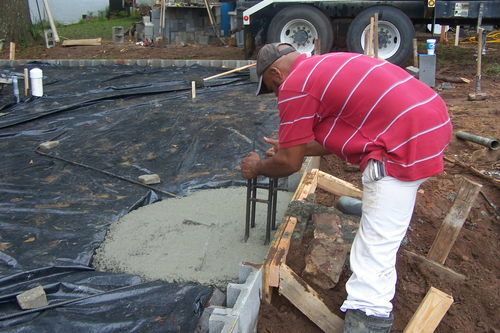 I really hate pouring concrete. Love new shops. 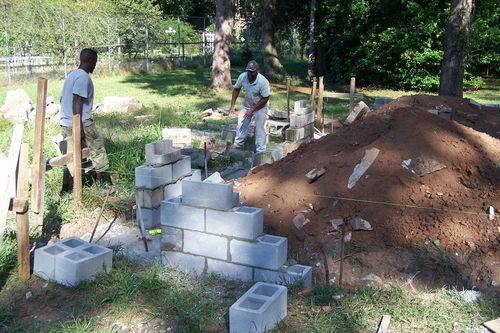 This is coming along great Dewayne. I’m glad that you have a good flat spot for it. Great work! It looks like it will be a good sized shop. Looks like you have a great shop on the way. Having Water and a necessary room in the shop is a great big plus. I had to add it to my shop and it it’s a great pleasure not having to hike back to the house. I hope somebody takes pictures of the building going up. I am looking forward to seeing them. Dewayne, I’m excited for you. Can’t wait to see it once it’s finished. Doug we are going to Riverbend Campground between Clayton and Hiawassee. Won’t make it up that high or far over your way. Tony a friend of mine said it rained hard at his house all day we poured which is about 8 miles from us. Also a big cloud went west of us. There was a couple of times we kinda panicked and thought we were going to have to get some plastic to cover it. Good Lord just was looking out for us. Thanks Gene wish you guys could go with us. Yea Dave I’m ready for things to end now. I can see the light at the end of the tunnel and it ain’t a train. Monty I agree with you totally. To many hoops to go through. Joe all ya gotta do is next time you walk out the door get started. Haaa Haaa That’s the way I was feeling bout Charles a while back. Charles you gave me the incentive to go ahead with my shop. If you haven’t I hope you finish yours soon. Stefang and Thos. Angle thanks for the comments. Bigrock Thanks. It’s not that far to the house but it is nice not to have to run. Haaa Haaa. I will be taking more pic for sure. My wife is a camera bug so we get plenty of pic. No mountains in South Ga but they got some pretty good hills in North Ga. Thanks Ninja. I can’t wait either. Lookin good!! !we will keep following..
-- IF YOUR NOT MAKING DUST...YOU ARE COLLECTING IT! SOUTH CAROLINA.